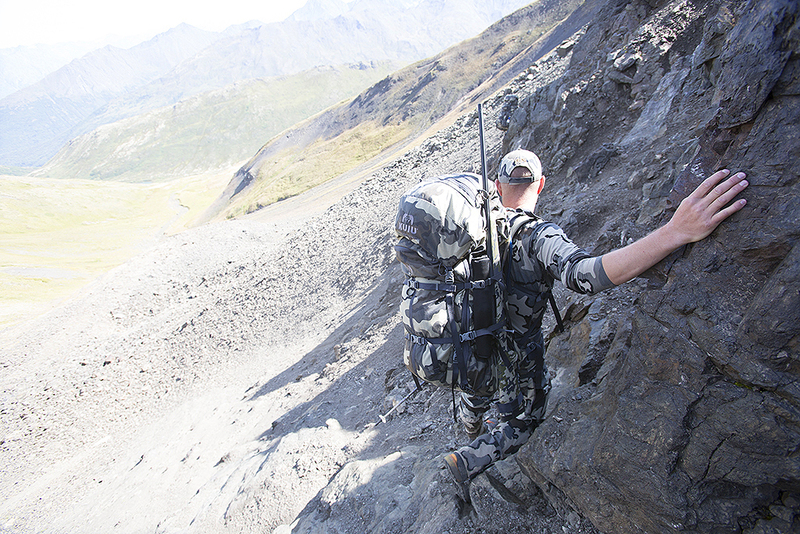 Not many people would sign up to do three physical backpack sheep hunts in 60 days, but that is exactly what Brendan Burns, who manages KUIU Professional Services, was able to do this fall. 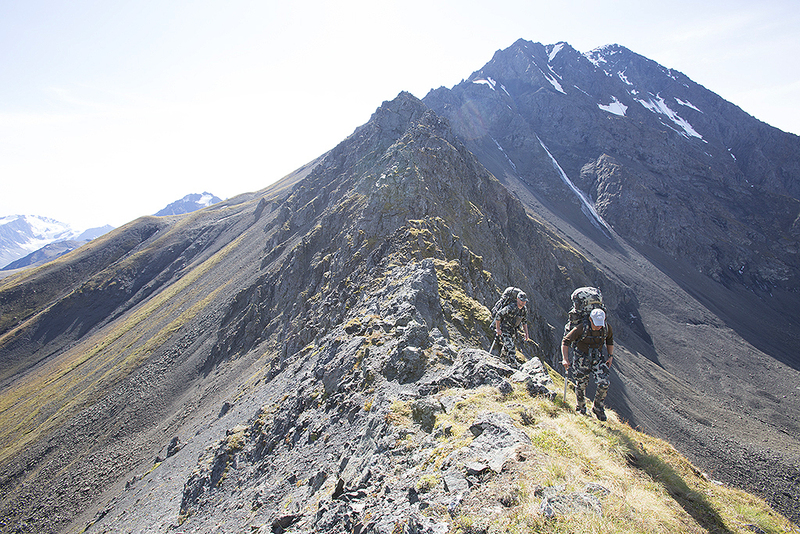 Sandwiched between a Northwest Territories Dall sheep hunt and a once in a lifetime bighorn hunt in Montana, Brendan ventured into the Chugach mountains of Alaska for a Dall sheep hunt in some of the most rugged sheep hunting conditions in North America. 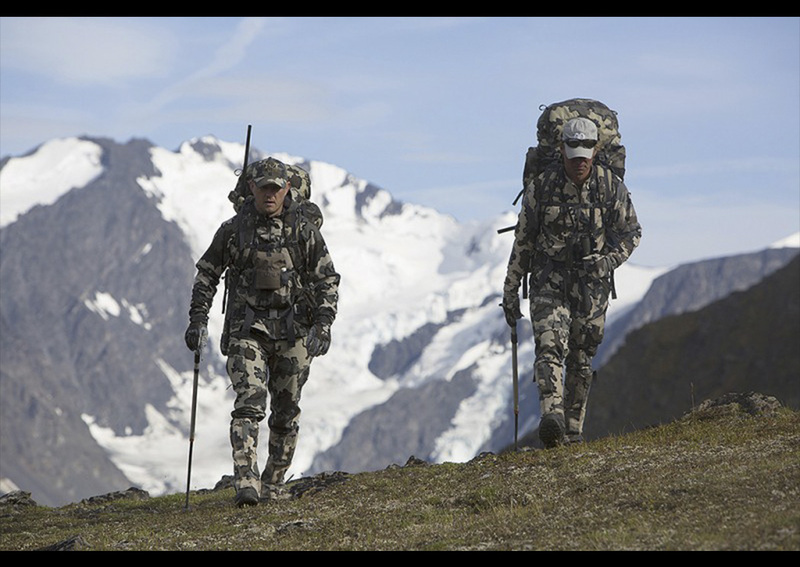 Hunts like these are a constant reminder here at KUIU of the challenge our customers face while hunting throughout the world and are the driving force behind every product we offer. In February of this year I found out I had drawn one of a handful of nonresident Dall sheep permits issued for Alaska’s Chugach Mountains. 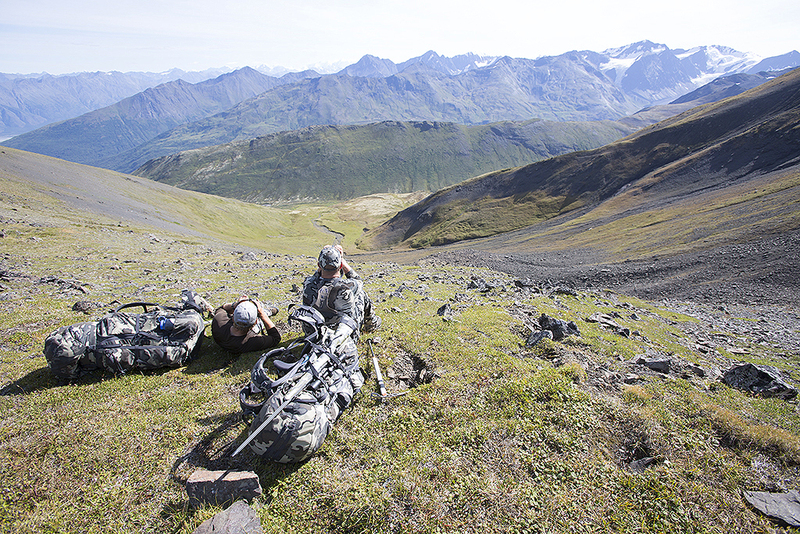 At nearly five hundred miles long, the Chugach is broken up into 20+ different hunting units and hunting dates. These areas are commonly referred to as 14A, 14C, and 13D. Having applied with Lance Kronberger of Freelance Outdoor Adventures for the last decade, it was a pleasant surprise to draw a permit. The area I drew my tag for could be argued as one of the lower-end quality permits to have in 14C. The area my permit allowed me to hunt is historically a big ram mecca, but has fallen on hard times in the last few years. Shrinking sheep numbers combined with crushing winter kill in 2012 and 2013 have left the area a shell of its former self. After several talks with the local fish and game biologist, Lance’s scouting, and some local experts it became clear my timing on drawing this permit was a bit off. As they say, you never know until you go. 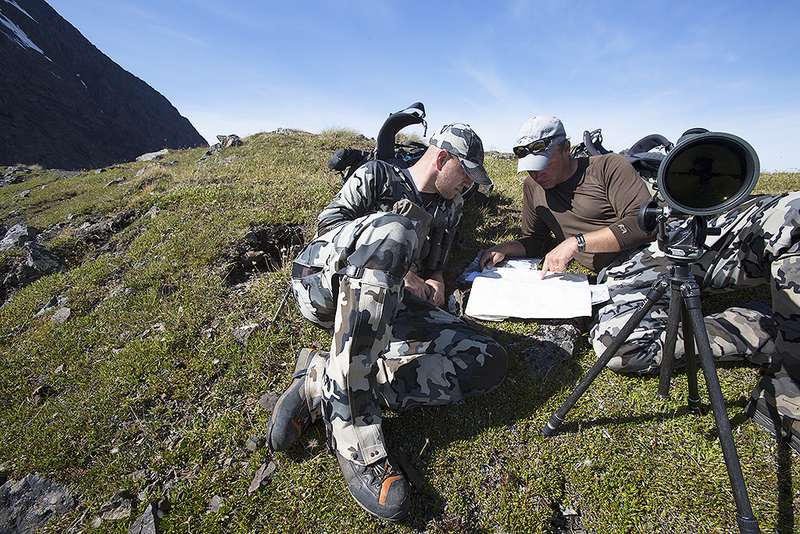 Plus, as any hunter knows–there is no such thing as a bad sheep tag! 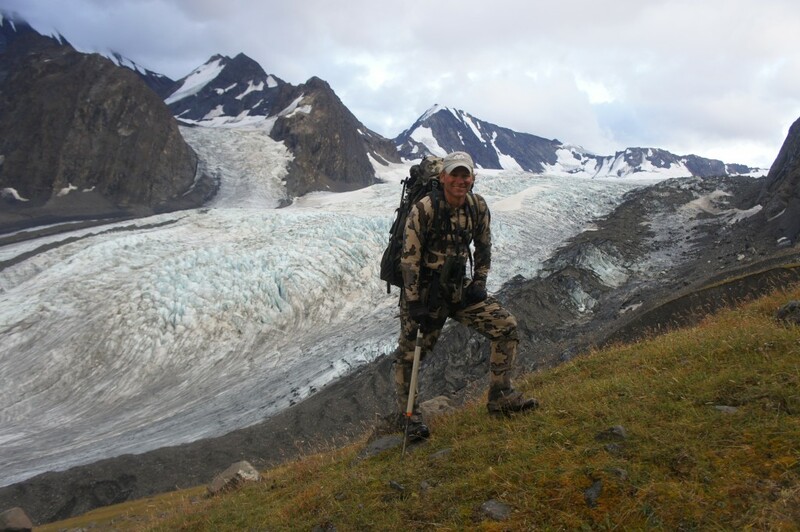 After a great trip to Nahanni Butte where I took a beautiful 12 ½ year old ram and a great mountain caribou (more on that later), myself and photographer Paul Bride flew from Fort Simpson to Anchorage for the second half of back-to-back sheep hunts. My Guide on this hunt was John Rydeen. 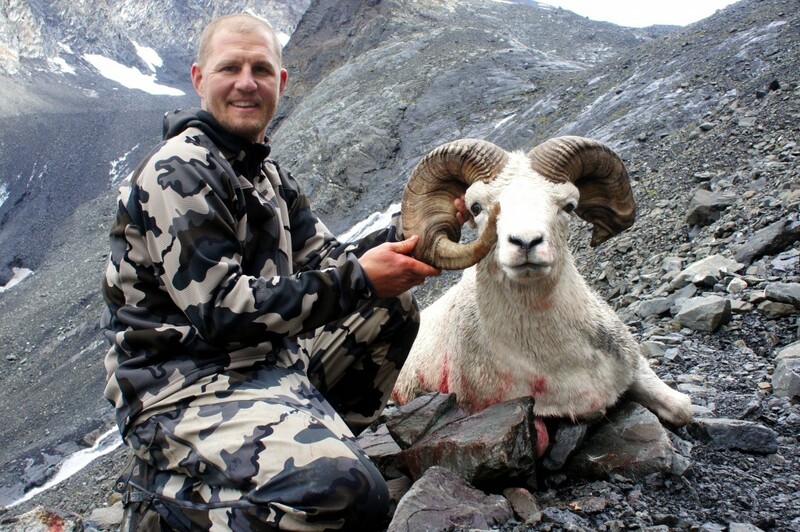 John is a 15 year veteran of the Chugach and has been on a pile of great rams. I have known John for quite a few years and was looking forward to hunting with him. We had 11 days to find a ram, so we loaded six days worth of food and gear (we would air drop the last 5 days if we needed it) and headed in. 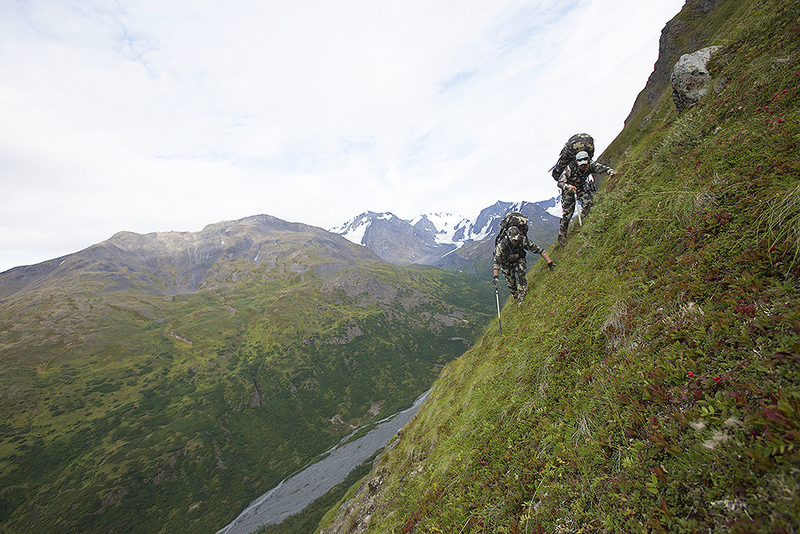 The Chugach Mountains are widely considered some of the toughest mountains in North America to hunt. 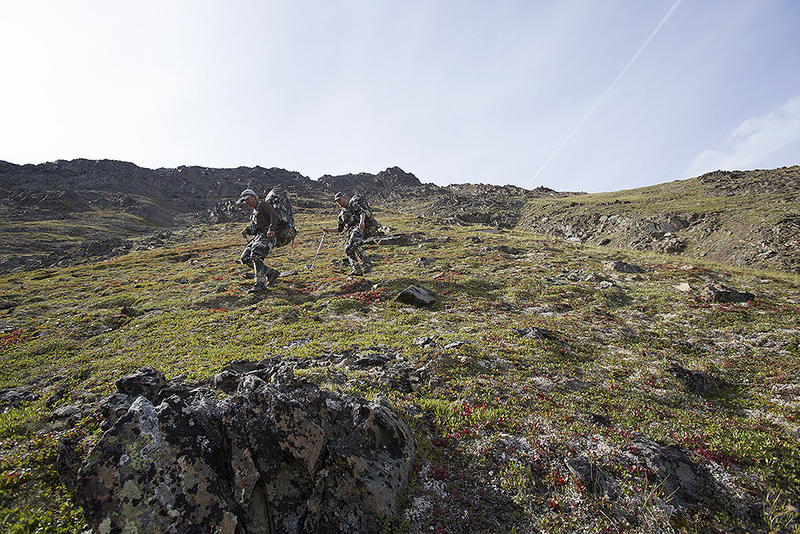 An unusual combination of extremely steep compact mountains, loose rock, thick brush, terrible weather, and glacial ice make it a hunt like no other on the continent. With no real intel or tips to go on, we decided to start at one end of the unit and hike out the other in hopes of finding a legal ram. It was a big undertaking, but with nothing specific to go after, a thorough inventory of the entire area was the best option. The first day and a half was a grind. No other way to put it. Tons of vertical, mind- numbing brush, and steep side hilling with heavy packs. The only plus was unusually nice weather. 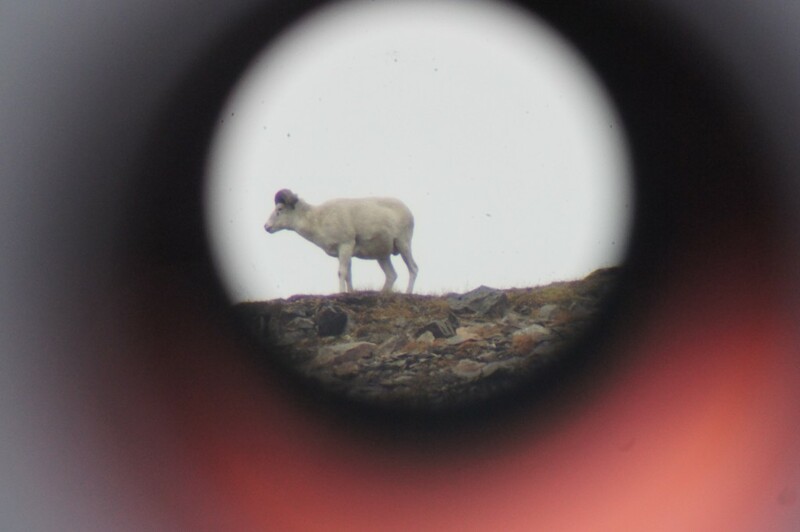 We glassed some good sheep country, turned up quite a few sheep, including a good number of young rams, all the while eliminating a large chunk of the area as we headed deeper into the glacier country. The hunt took an unexpected turn the second evening. 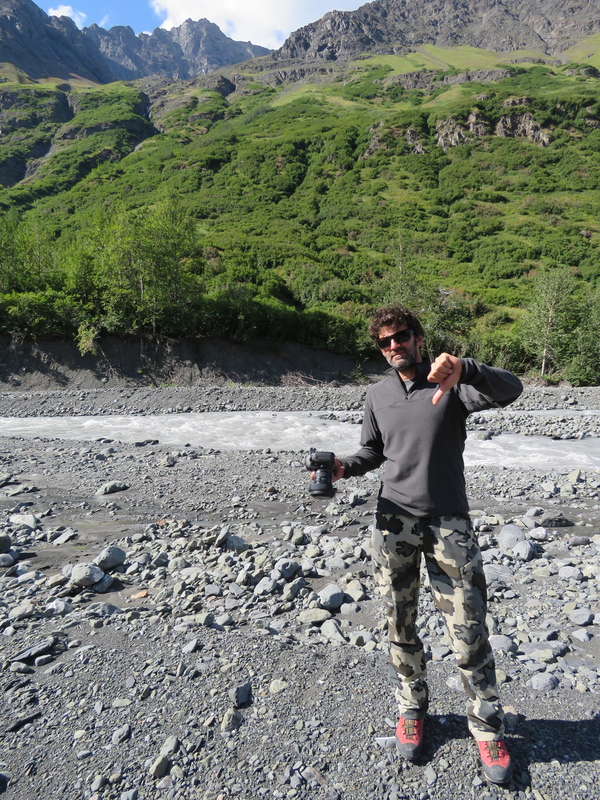 While crossing a swollen glacier stream, Paul and John both got swept downstream and fully submerged. Thankfully no one was injured, aside from Paul’s camera, which was a total loss. Without a camera to shoot with we decided it would be best to split up Paul’s food and have a plane come get him. The morning of the third day was spent building a small cub strip for his pickup. In the early afternoon Paul was on his way out leaving Johnny and I with a little more food and a lot less photo talent. (You’ll notice a drop off in photo quality at this point. Between John and I we had two small point and shoot cameras with one battery apiece). 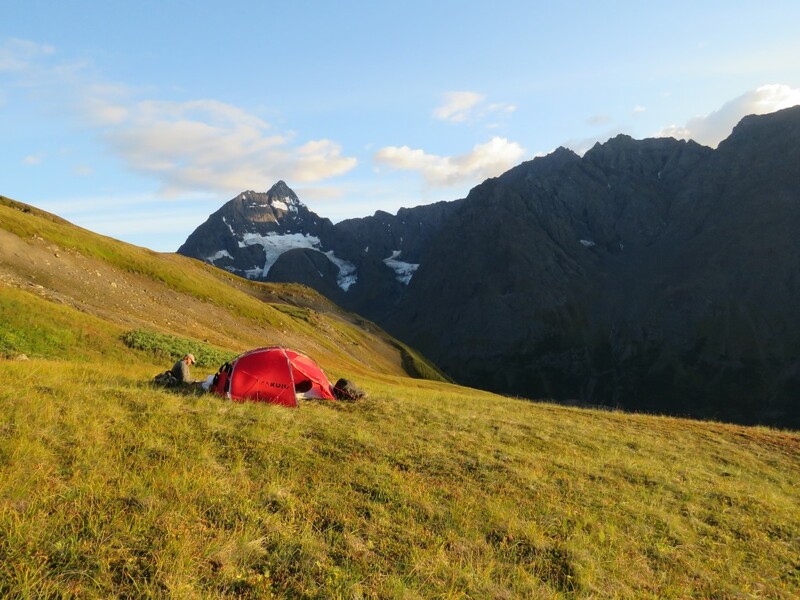 That night we climbed high onto the ridge that basically separated the area in two and set camp in as nice of a spot as you could pick. 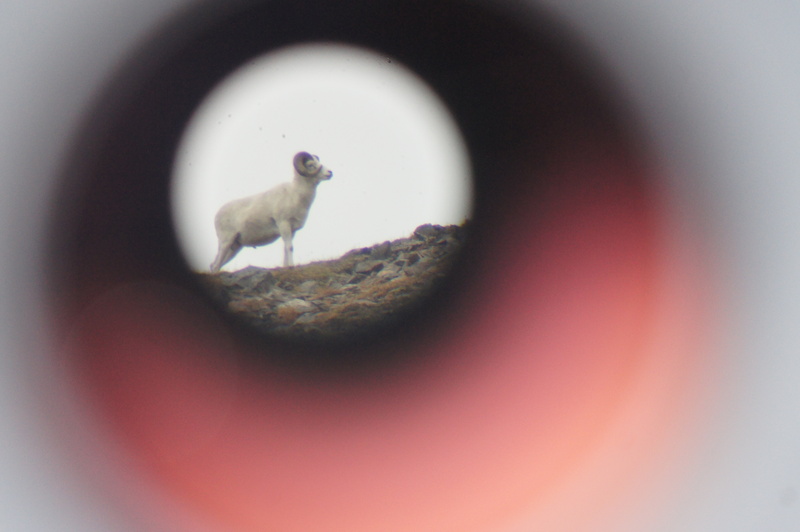 The following morning from the highest point, we glassed for several hours searching for a direction and a ram to go after. 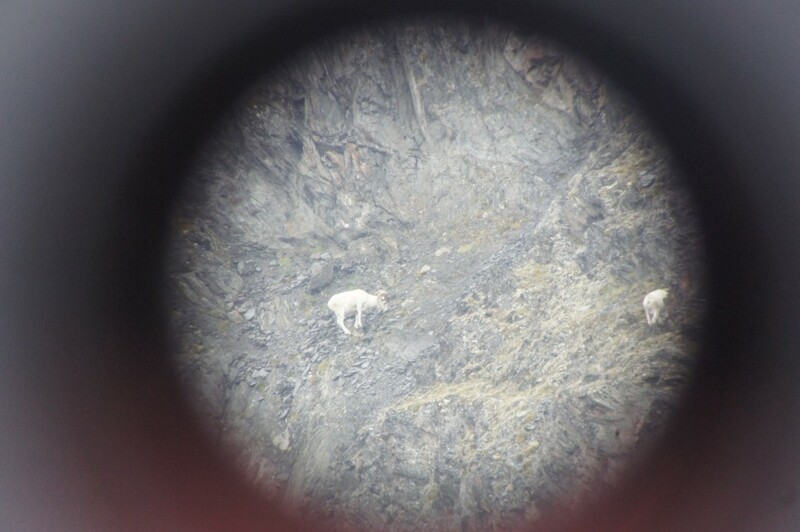 Two major drainage’s and a glacier away, we spotted two rams lying up on top of a mountain. One was a young ram, the other was unlike any ram either of us had ever seen. From great distance it was clear he was an old ram by his body, but what was on his head for horns was hard to identify. We could only see one side. It looked as if his horn was busted off very short. We would have to get a closer look to see exactly what he was. With nothing better to go on we decided to make another big move into country we could only speculate we could get to. On the map it looked like there was a route to the valley that held the ram. It was another camp and a solid ten-hour grind to get to where we wanted to be. 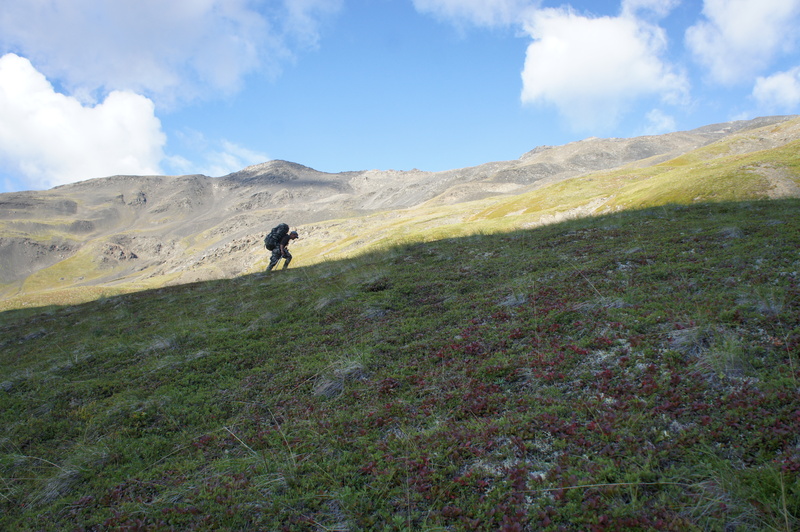 Finally, after bushwhacking three valleys, losing and gaining several thousand feet each way, we finally wrapped around the toe of the glacier and headed into the valley where we had seen the rams. The weather turned awful (or normal for Chugach country) with heavy rain and high wind. After quickly setting our fifth camp, we headed up to see if we could relocate the ram from where we had last seen him 24 hours ago. After a few hours of creeping up the valley slowly picking apart every possible hiding spot, we finally found what we were looking for. 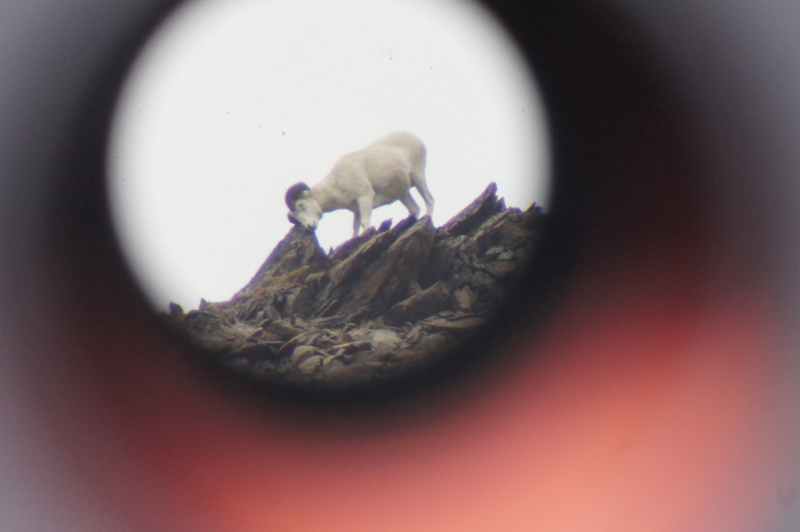 Staring down from a nearly untouchable perch high on a rocky spine was one of the most unique rams either of us had ever seen. The term “ Ram with Character” is thrown around a bit loosely when it comes to sheep, but this ram would surely qualify. 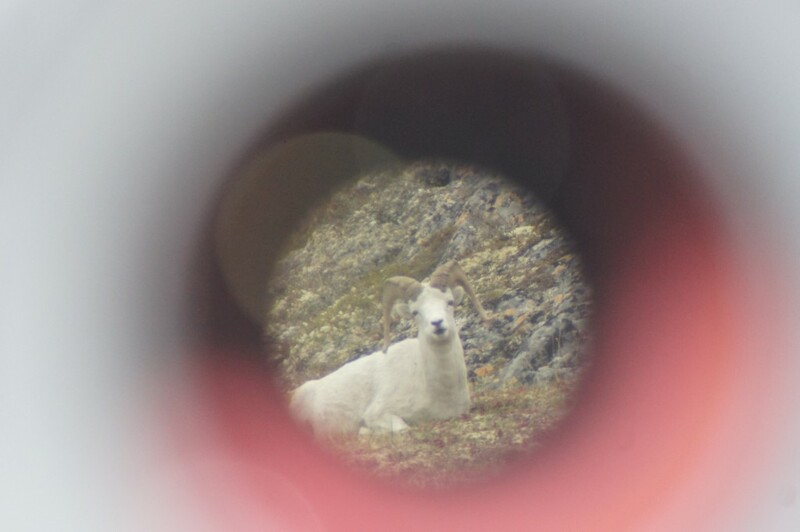 We couldn’t decide if it was the ugliest ram in the history of Alaska or the coolest Dall sheep of all time. We settled on both! There was no doubt this was the ram I came for. Now we would just have to figure out how to get “the beast” killed. 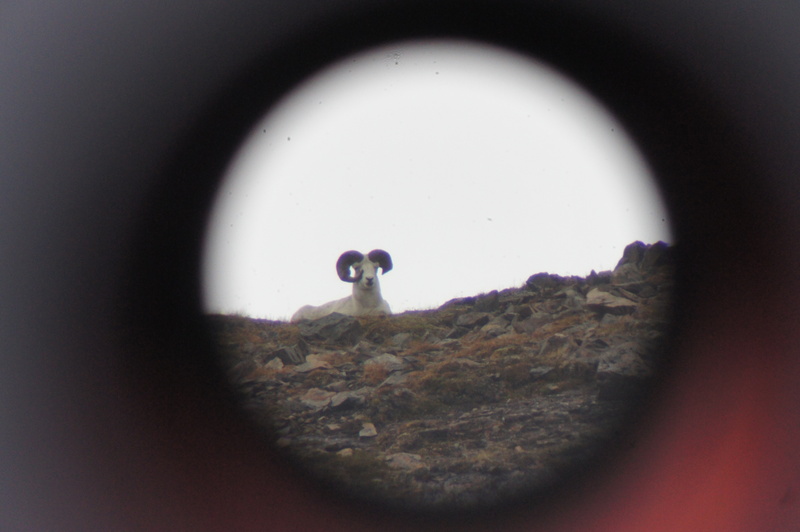 The good news was after four days of hiking we finally had a ram to hunt. 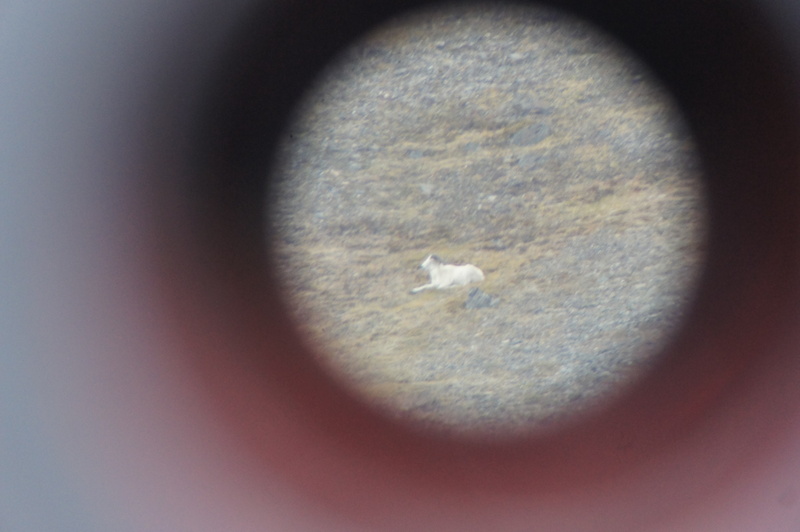 The bad news was the ram was perched in an unhuntable spot and looked fairly comfortable where he was. 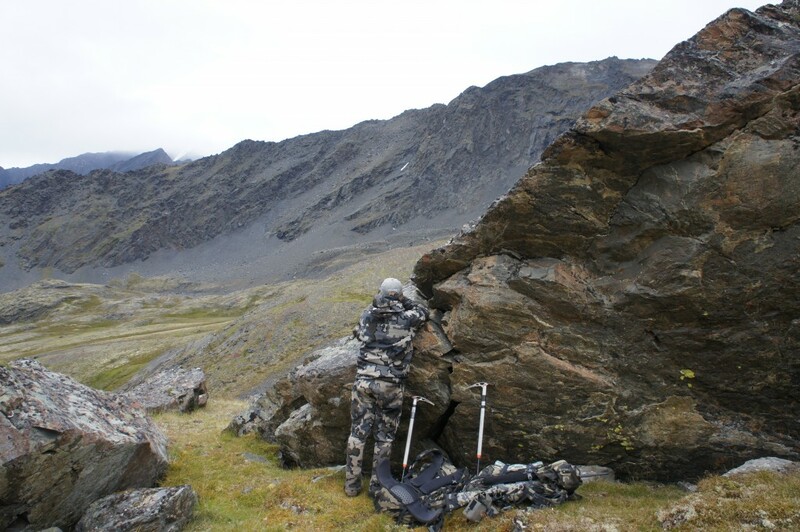 The bed and patch of rock he was inhabiting was unapproachable in any direction to less than seven hundred yards. Even if I could have made the shot at an extreme angle (I couldn’t on my best day) the ram was unrecoverable. John and I dissected the basin for a way to get closer to the ram. 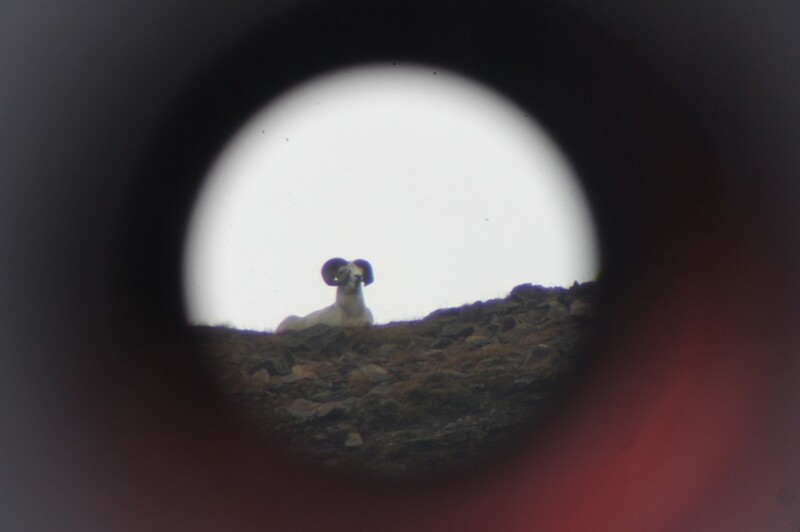 Staying out of site, we climbed and were rejected on every possible route we tried to get within shooting distance of the ram. Day after day the ram did nothing. Same spot, same bed, feeding only in a small patch of mixed rock and grass. Several young rams came by his perch and moved through, yet the big ram stayed put. On the eighth day, we again climbed into the basin to watch the ram only to find his bed empty. 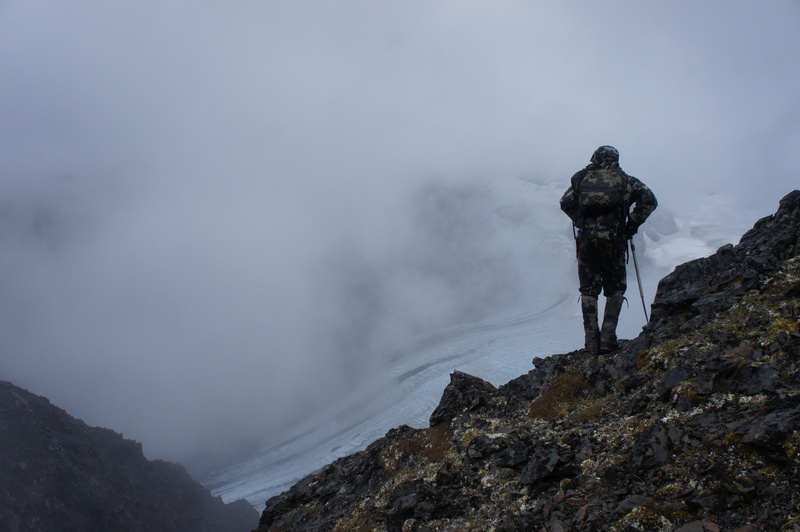 After exhausting every exit route in the basin we were in, we surmised he had dropped off the backside of the mountain to the glacier. 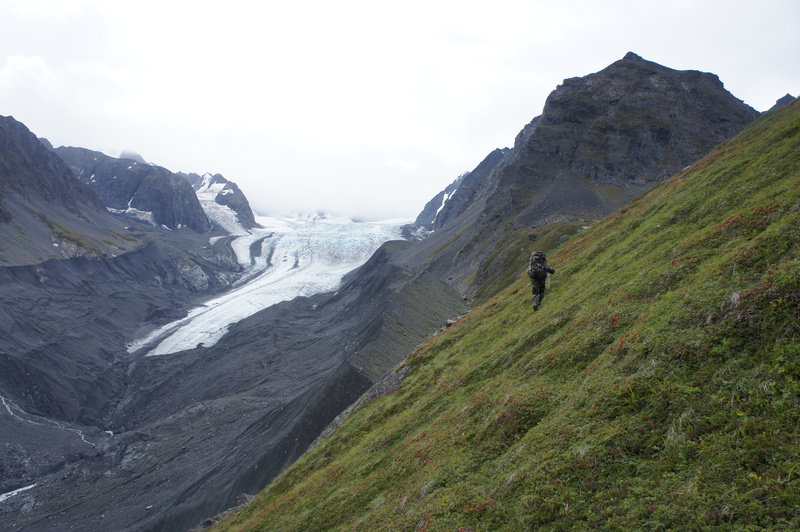 We worked our way down the valley and wrapped up the main glacier higher into country we hoped we could get to. 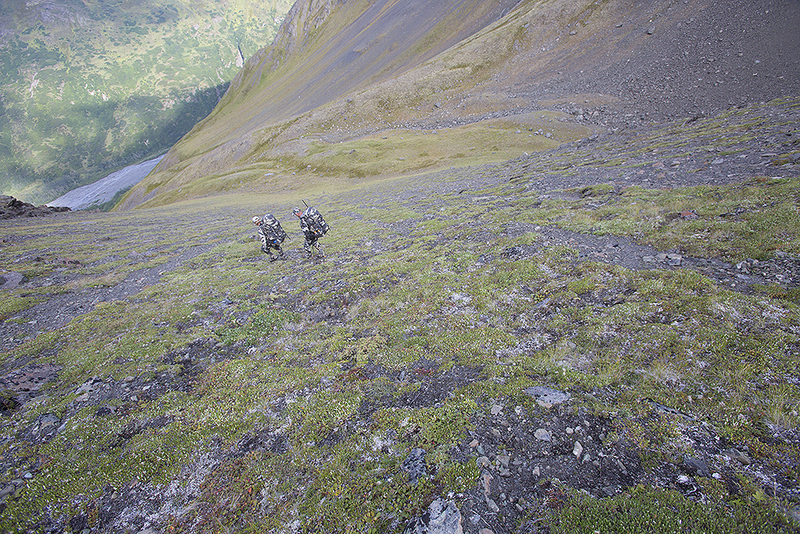 We were heading into the end of what we could access without climbing gear. 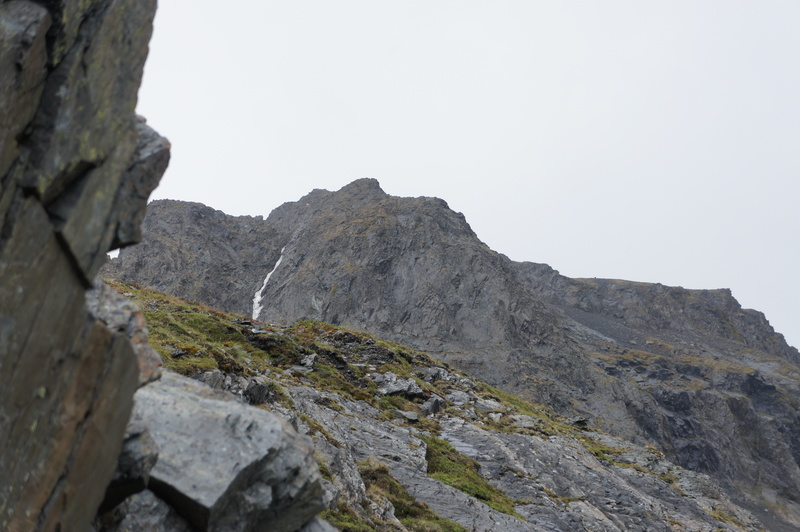 After turning the corner at the convergence of two glaciers, we found ourselves pinned down by two small rams. For two hours we laid in the shale waiting for them to move up the valley. We guessed “the beast” was very close. As a big fog bank moved in, the smaller rams got up and headed up the moraine with purpose. As they disappeared out of sight, we quickly followed. 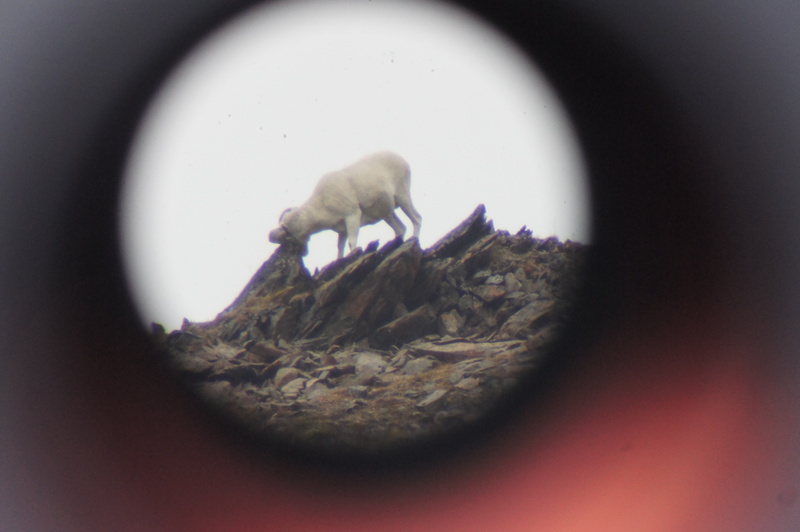 As the fog cleared, I spotted “the beast” and five rams picking their way back up to a deep crack in the face of the mountain leading back to his perch. At four hundred yards “the beast” separated from the other rams, giving me what would be my only opportunity on this hunt. My first shot anchored him, and two more finished the job. The sense of relief as he tumbled out of sight is hard to describe. We made our way to the ram and finally got to see up close the animal we had been staring at for days. The ram was more than I could ask for. It’s my first Glacier Ram, and like these mountains, he is ancient, massive and unique. The term ”score doesn’t do this ram justice” was coined for this ram. It turns out that “the beast” had suffered a massive head injury from either a substantial fall or a horn related sickness in his cores at 3 years old (total speculation). Amazingly he recovered over time to add ten more rings, a true testament to the toughness of these animals. Like most hunts pushed to the end, the pack out is brutal and rushed. Not many outfitters are dying to help on the pack out, but Lance met us half way out to share the load. It was a welcome break and cuts hours off our exit from sheep country. I want to thank Lance and Nikki Kronberger at Freelance Outdoor Adventures for always putting together a great hunt. Most of all I want to thank John Rydeen for truly embracing the grind on this hunt. 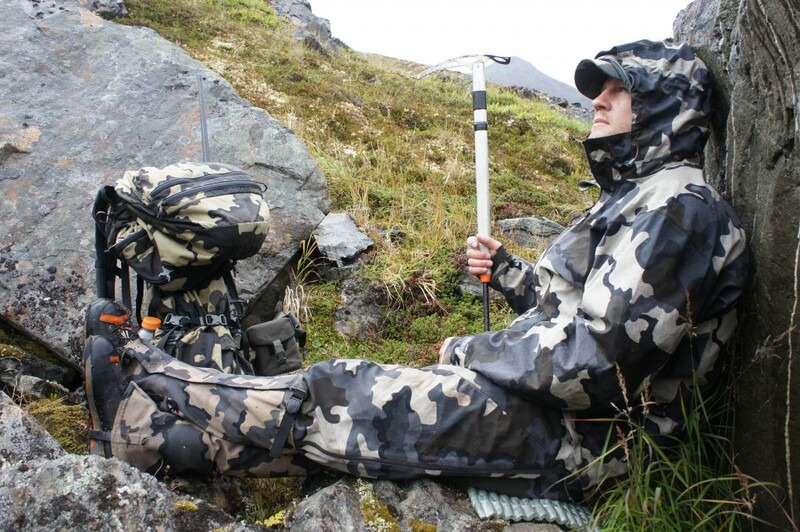 It’s not easy to stay positive in tough weather and hunting conditions, but John was the whole time. This hunt was among the most difficult I could ever hope to go on, not fun for a good portion, but that is what makes it special. A sheep hunt and a ram I will never forget. Thank you Robert. Glad you enjoyed it. Sweet Ram. Thanks for sharing. Thanks for taking a look. He is certainly a unique ram. Thanks for sharing the story! Epic hunt with a great harvest. I can’t imagine those challenges of the extreme terrain! Maybe someday. Way to go for it! 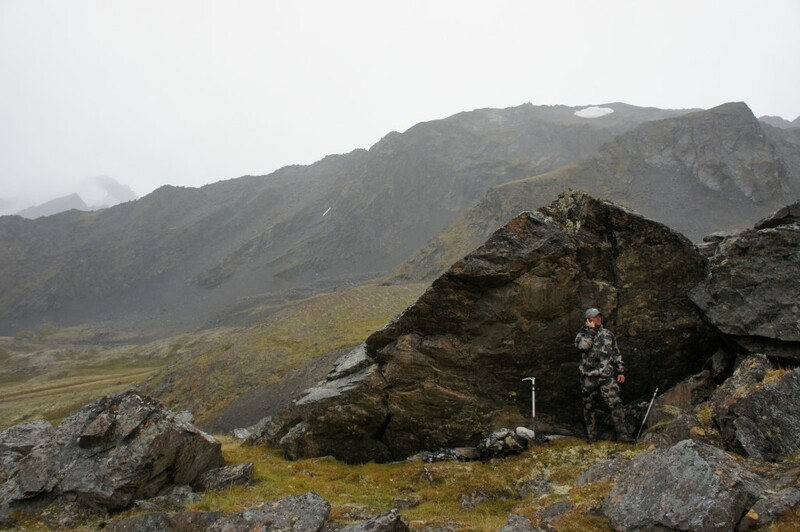 It was definitely one of the most physically challenging hunts I’ve ever done. 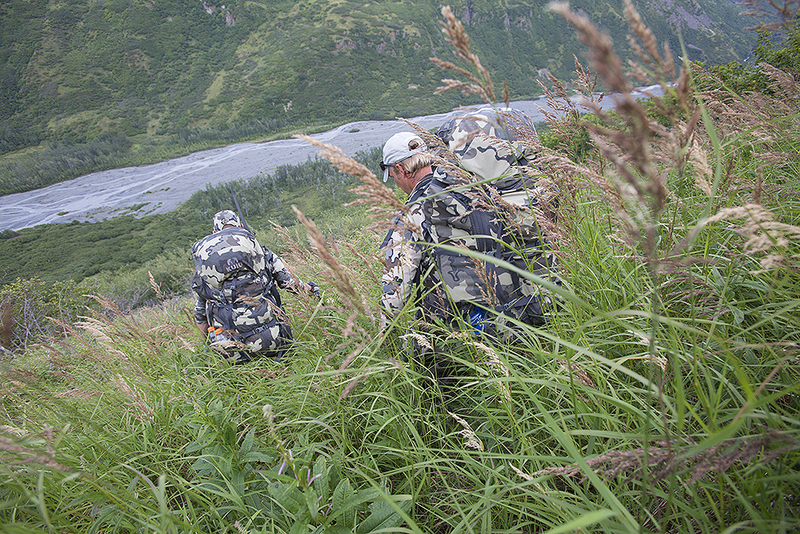 Application season is just starting in Alaska. Next year might be your year! Great ram Bendan! Love the uniqueness of the old guy! Thanks Brian. Hope you are having a good season up there. 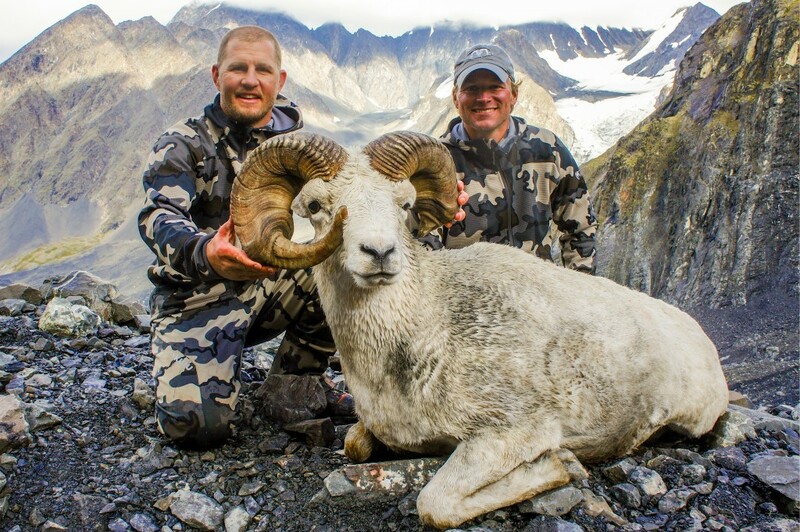 Congrats on a cool looking ram and a great story . Thanks Greg. Hope you are having a good fall. Looks like a good hunt!! 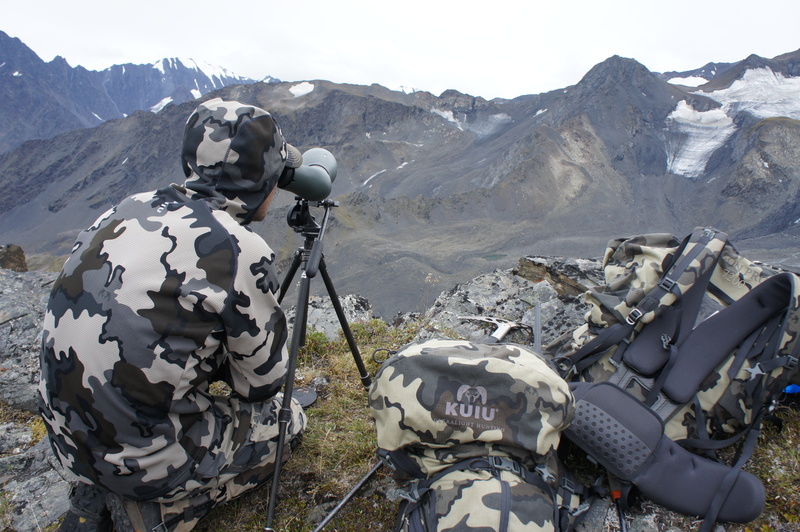 Was nice to see everyone outfitted in new Kuiu gear. Ill have a full gear breakdown of what I used on the hunt shortly. Congrats! I’ve done that hunt twice in October archery hunt! That is a nasty hunt as well, as you know. I did that 14C October hunt in 2012. Horrible weather. 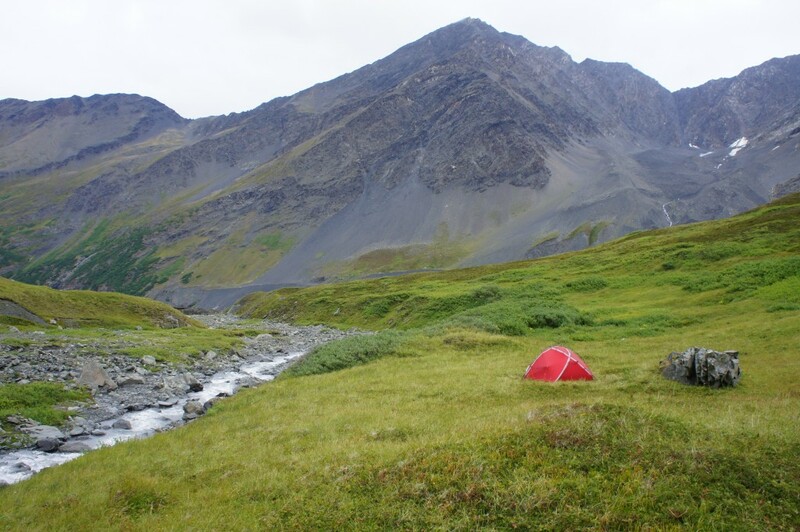 I believe we spent 7 of the 10 days in the tent. Ill hopefully be able to do that hunt again at some point. 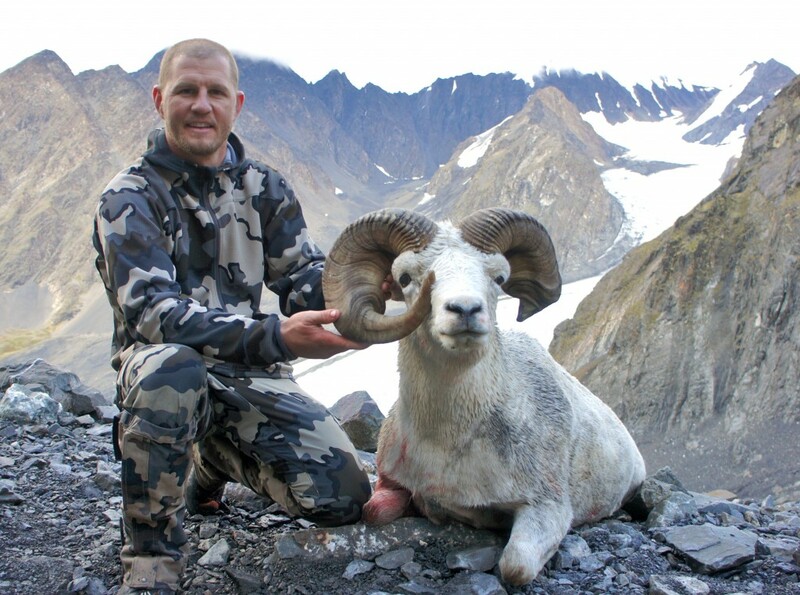 Awesome ram Brendan, looking forward to hearing about your Nahanni and Montana hunts as well. Thanks Tom.. Its been a great year. Hope you had a productive fall. Incredible story man, I love the old warriors with character so when I saw the first photo of this through your spotter I was hoping you would take him. Glad it all worked out. We hope your Ultralite Sheep Rifle worked out for ya 🙂 Send us some pics when you get a minute (colbykendell@gmail.com) and we’ll be sure to get them on our website and social media. Great job! Ill send some pics over shortly. Great story and great ram! 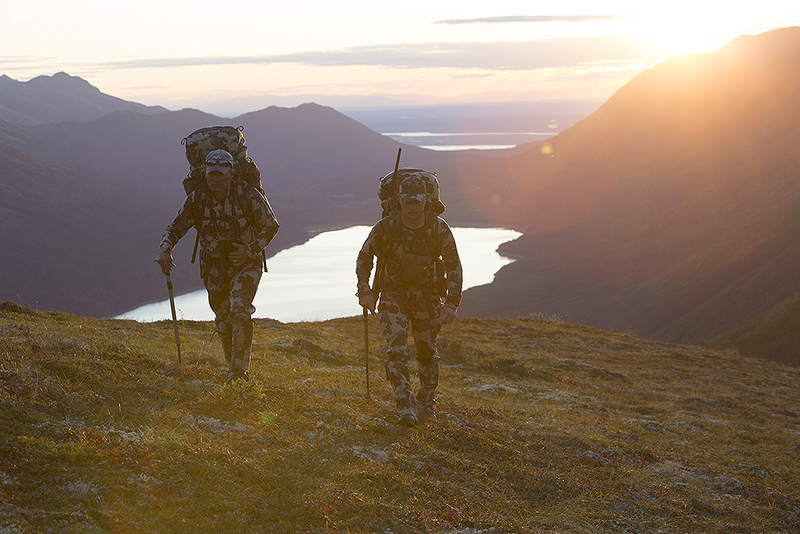 What rifle were you packing on the hunt? I was carrying a 6.5- 284 Ultralight sheep rifle made by Red Rock Precision. This is the fourth ram I’ve taken with this rifle. Very light and accurate. Great trophy Brendan! 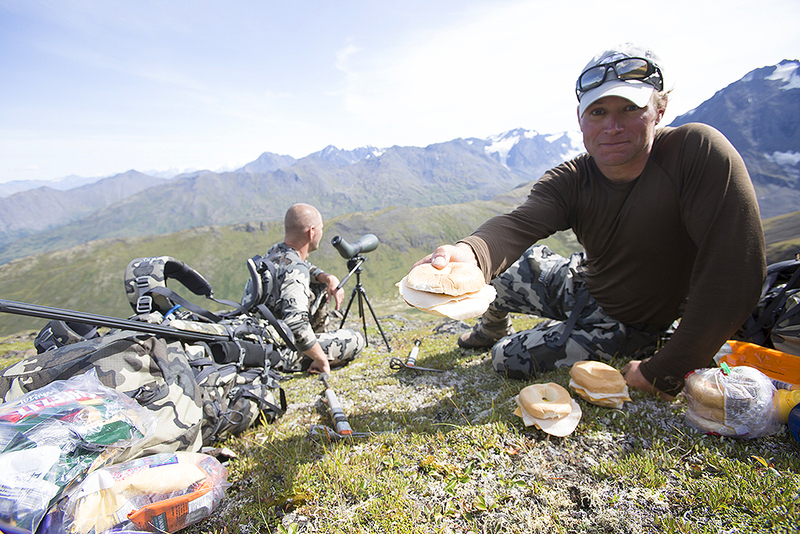 At some point, sheep hunts tend to become more mental than physical – but I think you experienced both at the same time! You are correct. It is hard to stay sharp when its mentally and physically draining. One day and one step at a time becomes the key. Thanks for commenting. What do the bases on that thing measure? He looks like he’s got the mass of a bighorn and then some!! Very cool sheep. He is 14 1/2 on the base depending on how you measure them. They are very concave on the inner horn. Very unique. 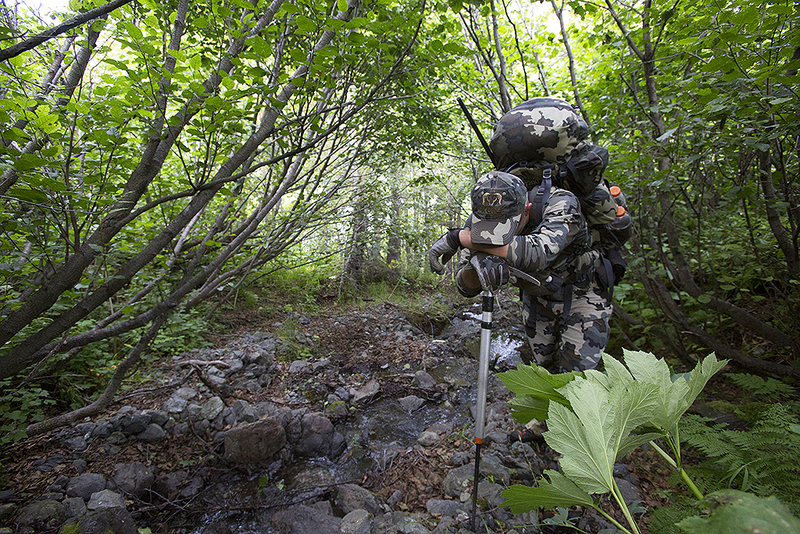 What Kuiu gear were you using? Congratulations Brendan for getting a once-in-a-lifetime unique ram! And for sticking it out waiting for your opportunity to get the chance to shoot him. 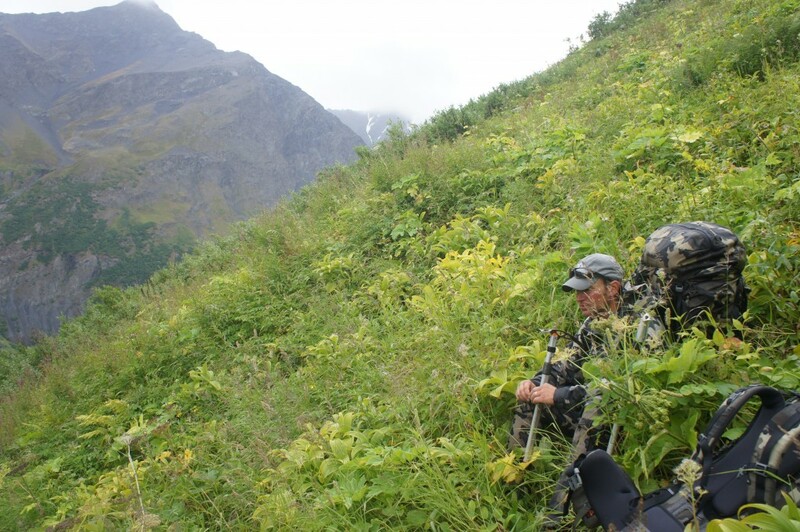 I’ve hunted in the Chugach for both a Dall ram and a goat so I know it can be tough unforgiving country to hunt in. 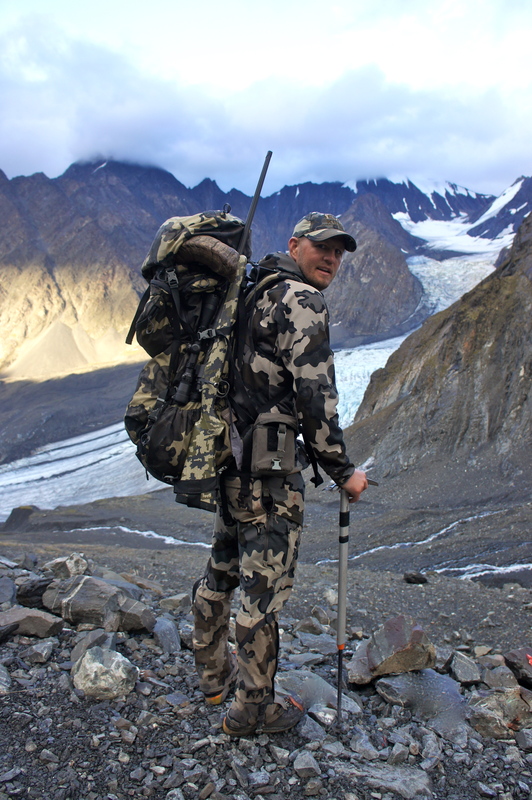 Dan Montgomery has been putting me in for the draw for the last few years so maybe I’ll get a chance to hunt it again – with Kuiu gear. Thanks Daniel. Good luck in the draw this year. Its a great hunt. 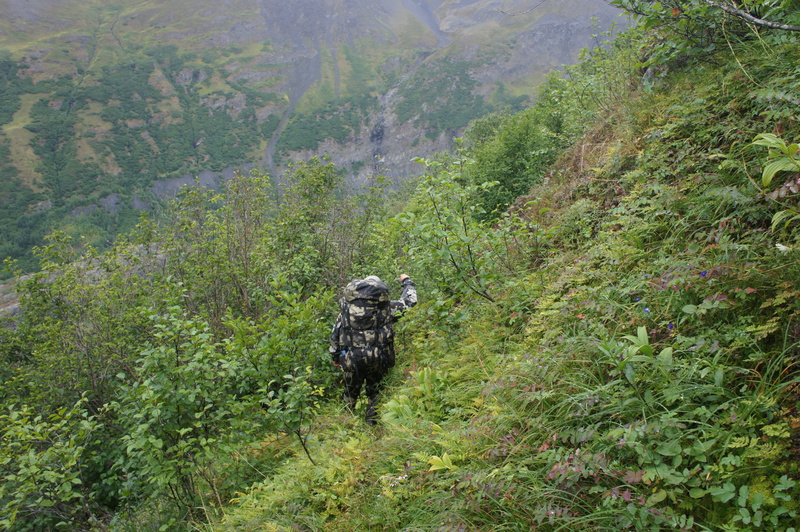 You will earn any animal in the Chugach. Great write up and nice pictures. Congrats on a great hunt. I too am interested in the gear breakdown and if you would have changed any of it and how it worked. Awesome story. Did you post a breakdown of the gear you used for this hunt? 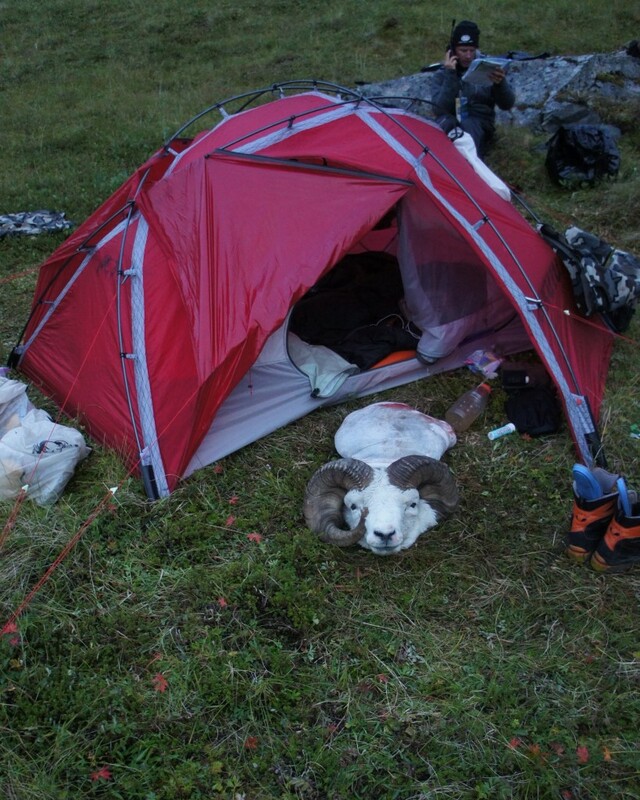 Looks like a new Kuiu tent in that last picture!? So much character in that old fella there Brendan well done mate! I dream of one day making the trip over from Aussie to hunt these beautiful sheep. Thank you, Joe! It was an incredible hunt. Hey Brendan. Amazing hunt. Is the rifle a Boswell titanium? Can you give us info on it? Barrel length, Caliber, bullets you used? thanks! 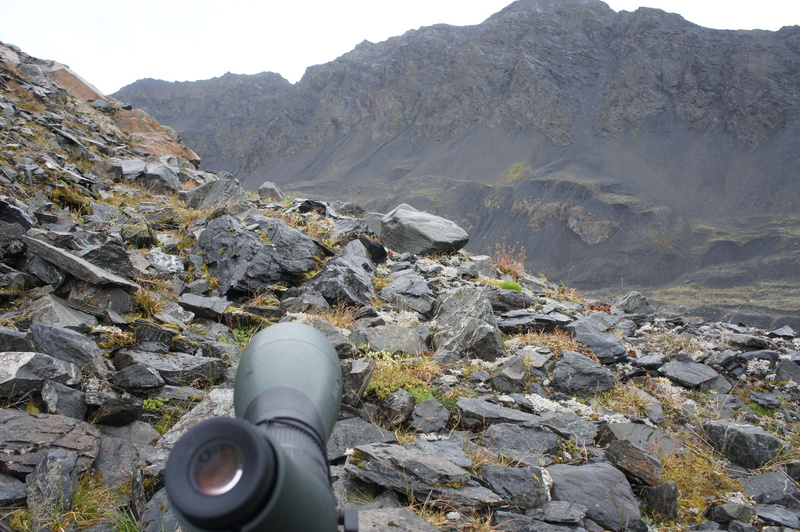 The rifle on my Chugach hunt is a Red Rock Precision Ultralight Sheep Rifle with a 4-14 Leupold Scope in 6.5-284. That is an inspiring story Brendan. 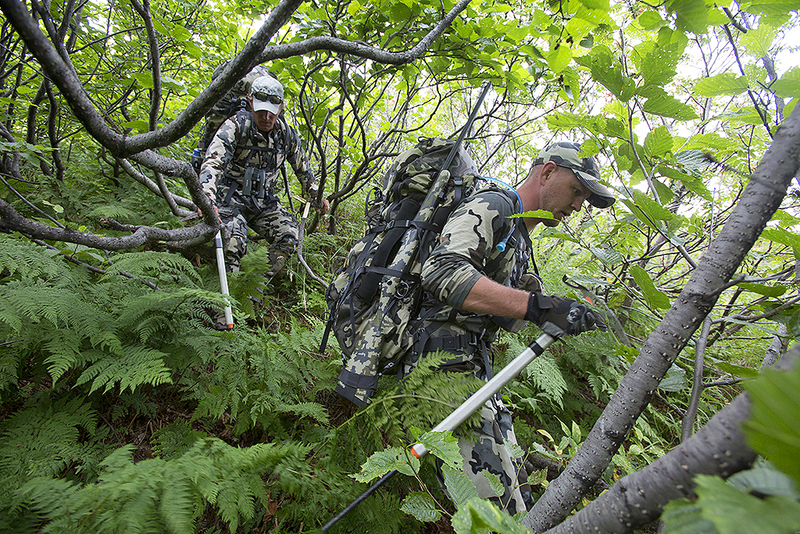 The details were laid out in a way that truly communicated the toughness you guys brought to the hunt. Man, that wait must have been harder than the physical labor. Good photos too, in spite of the mishap.